Advantages: Interesting and easy to read text, inclusion of a wealth of facts and figures, high quality colour profiles, interesting and well captioned wartime photographs. Philedition continues it coverage of wartime RAF Squadrons with this recent publication, "No. 501 (Gloucester) Squadron 1939-1945 Hurricane, Spitfire, Tempest"
The book is 139 pages plus soft covers in compact B5 format. 501 Squadron was equipped with Hurricanes in March 1939, and saw action with RAF Fighter Command from the first days of the Second World War until the end of the conflict, first in their Hurricanes, then in Spitfires and Hawker Tempest. This title commences with a description of Hurricane aircraft and operations (including serial numbers), followed by simialr summaries of 501 Sqn Spitfirs and Tempests. This opening section occupies 47 paes. The largest proportion of the book is taken up by Apendices. 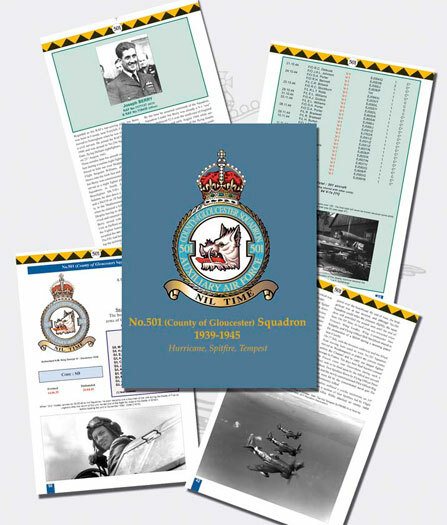 These include awards, code letters, Squadron bases, claims, losses, Roll of Honour, POWs, and a remarkably detailed Squadron Roster with photos and details of 501 Squadron pilots. The very readable text is supported by very impressive colour artwork by Malcolm Laird, and many large, well produced wartime photographs. Although the book is not divided into Chapters, as such, the layout is logical and easy to follow. Phileditions' "501 (County of Gloucester) Squadron 1939-1945" will be of interest to armchair historians and modellers alike.